In his 97 years, Fr. Theodore Hesburgh oversaw the Civil Rights Commission, the International Federation of Catholic Universities, several Vatican and United States delegations and the University of Notre Dame. The rest of the world took care of the cigars. Junior Tommy Schneeman said the president emeritus was smoking the first time he met him. “He was over 90, and it was like, alright, interesting,” Schneeman said. “[He] never had any health problems, which is like a miracle in itself. 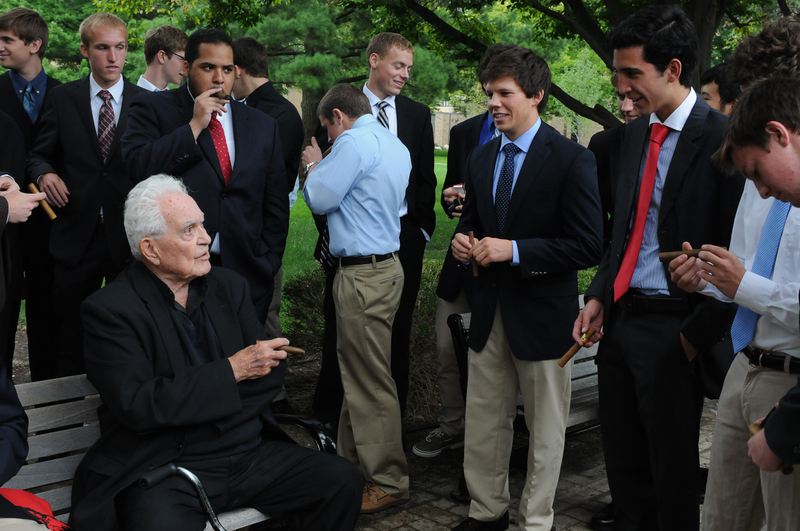 So Hesburgh kept smoking cigars — and people kept sending them — until his death Thursday. “He continued, in his final days, to visit with family, friends and fellow Holy Cross religious and to enjoy the occasional cigar,” University President Fr. John Jenkins said in an email to the Notre Dame community Thursday night. That evening, among the Grotto candles lit in his memory, someone left a cigar in a candle holder for him. On Friday, Schneeman and juniors Brian Cimons and Andrew Glover gathered to light cigars under Hesburgh’s statue in front of the library named for him. “I always kind of wanted to smoke one with him but never got to,” Schneeman said. “So this is the best we can do,” Glover said.